G-Code software for programming CNC machine jobs has an important role in the success of a machine shops success in both productivity and the quality of parts being produced. CAD-CAM providers look at how a shop handles the workflow from when a job comes in to how the job is finished on the CNC machines. CAD-CAM technology is often times used from the quoting of CNC jobs to the handling of CAD file data and then used 100% of the time in calculating machine toolpaths and creating the NC programs for the machine tools to stay productive and making revenue. Parts can be produced faster and more affordably now than ever before in the past because of G-Code software technology. CAD benefits for the average job shop include the ability to manage design files easily and editing them on the fly as design changes take place. Adding popular CAD Design systems to the shops toolkit can sometimes make the difference of being able to seamlessly collaborate with a client on a job or not. We find that the more options a CAD system has, the more flexible the shop can be in offering services to their clients from basic one off type parts to being able to fully manage assembly CAD part files and more. The list of design and editing features can be very long. Automation includes much more that just drawing with points, lines and circles these days. Popular CAD products such as SolidWorks now offer powerful simulation, design validation, tolerance analysis and even ECAD/MCAD collaboration features, not to mention powerful animation for assemblies, reverse engineering and much more. Many CAM providers have developed CAM plug-Ins for these design products. One such plug-in is BobCAM for SolidWorks CAM that offers complete 2, 3, 4 and up to full 5 Axis machining technology right inside of SolidWorks. A CAM software product that also offers CAD importing and geometry editing features for wireframe, solids and surface files is critical for job shops as the shop has to be able to translate CAD geometry and use it for applying CAM functionality 100% of the time. CAM programming software is becoming more and more wizard driven in terms of how CNC programmers are able to work with machining technology in toolpath. A great addition to the world of CAM was the addition of Dynamic Machining Strategies™ allowing an operator to apply any number of roughing and finishing toolpaths to a single CAD feature. Wizards remove the guesswork from programming CNC parts. CAM programs, also known as CNC Software will provide a wide variety of CNC Roughing and Finishing strategies that are developed to be machined at higher speeds to reduce cycle times, combine roughing and finishing strategies such as REST and Pencil toolpaths and much more. CAM Trees allow programmers to manage jobs faster and easier and eliminate costly mistakes at the machine tool through powerful simulation capabilities. 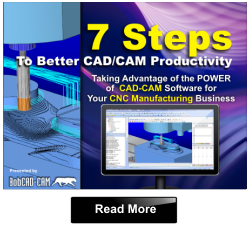 A recent addition made affordable enough for the average job shop was the BobCAD-CAM Machine Simulation Pro that allows the machines actual kinematics to be used to simulate the real world machine inside the software. It often times comes down to the small features that can make the difference such as being able to save and load machining features, override tool speeds and feed data within the CAM Tree or where a shop calculating high tolerance machine toolpaths with a CAM software that provides multi-threaded strategies to speed up calculation times. A great benefit to modern machine shops will be a modular CAD-CAM whereas the shop can add-on machining technology as the shop grows. Thus, making CAD-CAM instantly economical for the shop now as well as available for their future growth into multiaxis CNC machining as an example. A CAM system isn’t complete without a full post processing engine. Once the toolpath is produced and simulated for accuracy, the software should allow the operator to choose the post processor for their CNC machine to generate the accurate G-Code program to support the machine tool. There can be many variations of g-code. The post is specific for your controller make and model. To avoid delays, work with your CAD-CAM supplier up front on the exact post processor that you need. CAD-CAM for the modern machine shop will continue to add powerful design and CNC programming capabilities at affordable costs and with reasonable learning curves. BobCAD-CAM is a solution currently used by thousands of shops throughout the world. 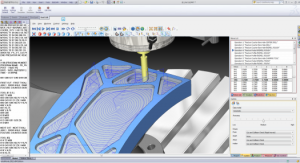 Priced affordable, BobCAD-CAM provides free one-on-one web based demos as well as downloadable CAD-CAM demos for all of their CNC Software products. 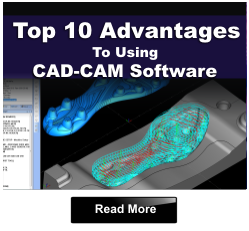 To learn more about CAD-CAM for G-Code programming contact BobCAD-CAM today at 877-262-2231. 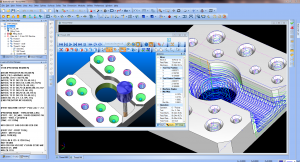 G-Code software helps shops translate CAD data into toolpath and G-Code for CNC. Learn more about this here.